Alright, are you ready for this? 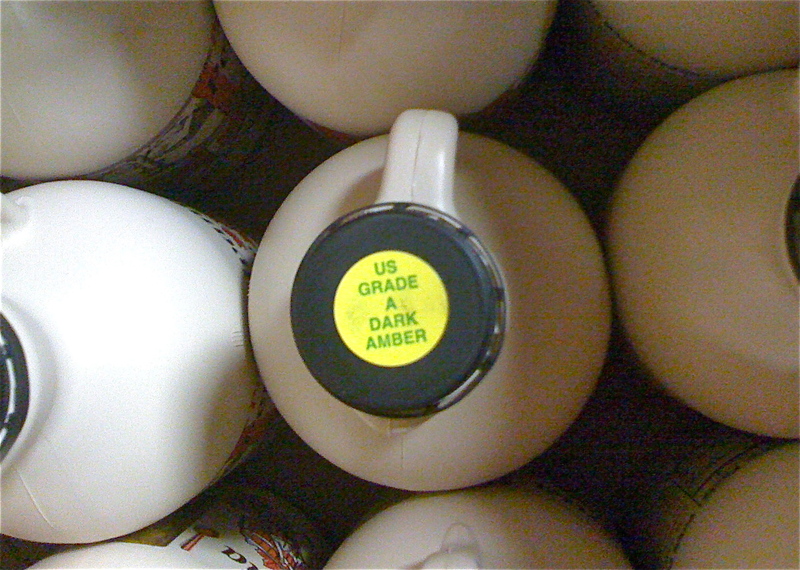 I used to be square in the fake maple syrup camp. I knew it was mostly flavored corn syrup, but that is what I thought maple syrup should taste like. Real maple syrup didn’t seem thick or sweet enough, and frankly, it tasted too much like maple (I know- it’s crazy talk). That all changed when I started volunteering at Slow Food Pittsburgh’s Farmers at the Firehouse Market (Saturdays in the Strip, next to Bar Marco, May 12th-November), making silver dollar pancakes so that visitors could try the maple syrup from Hillegas Sugar Camp. Seeing person after person lapping the last drops of maple syrup out of the sample cups made me wonder if I really was missing out… so I tried some, then I tried a bit more, and then just to be sure, I tried some more. After my misguided youth, I have found my way. I am now a proud member of the real maple syrup club. I think I get bonus points for putting it on my oatmeal everyday, too! A few weeks ago, I helped to organize a maple syrup tasting and pancake breakfast with Slow Food Pittsburgh and the Hillegas brothers, Brandon and Kyle, down at their camp in Somerset County. It was a great event! We had about 30 people attend. 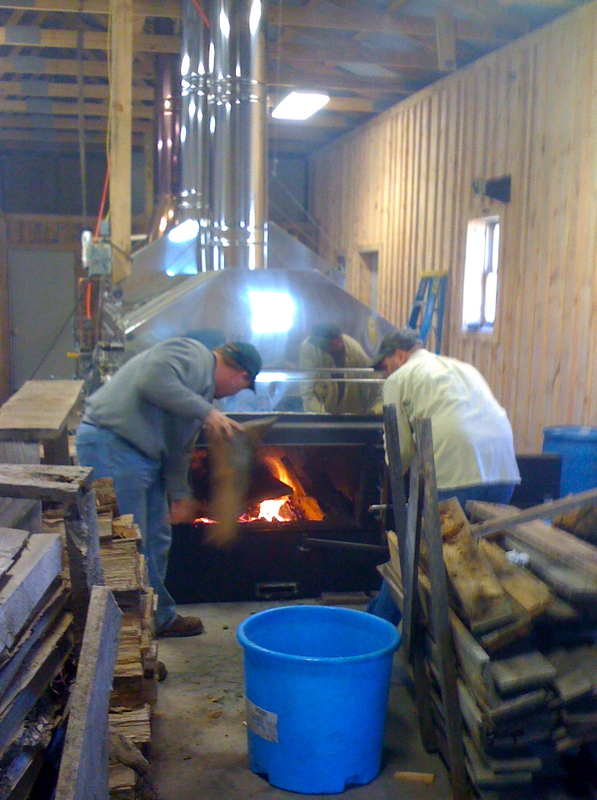 They were treated to an explanation of the maple sugaring process from Brandon, saw the process demonstrated by Kyle and his crew, and ate a locally sourced pancake breakfast. Plates were full of pancakes made from Frankferd Farm’s whole grain pancake mix, sausage made with Niman Ranch pork, and baked apples made from Dawson’s Orchard’s apples. Apple cider, butter, milk, and eggs were all local as well. 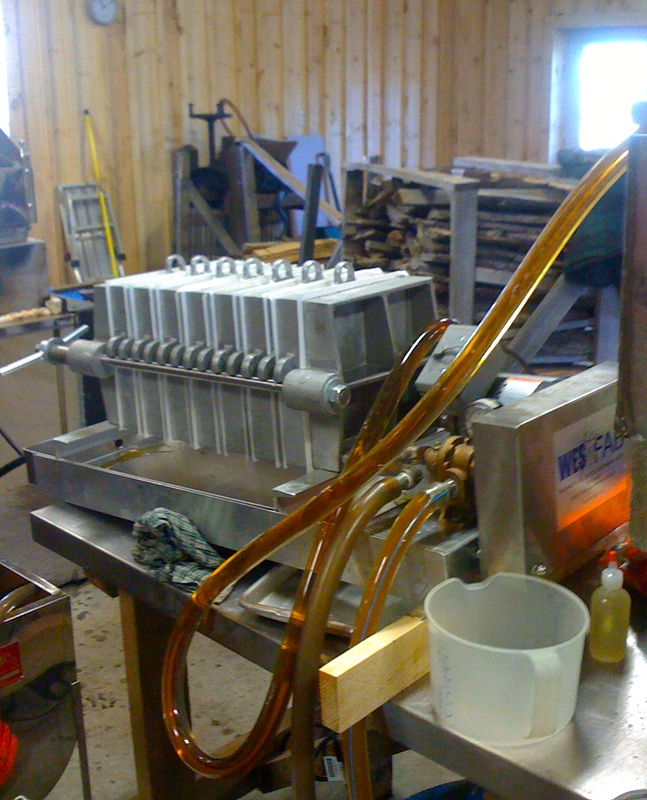 The event brought people to where their beloved maple syrup was produced, introduced them to the Hillegases outside of the market, and fostered a sense of community as everyone was gathered around the table to eat. 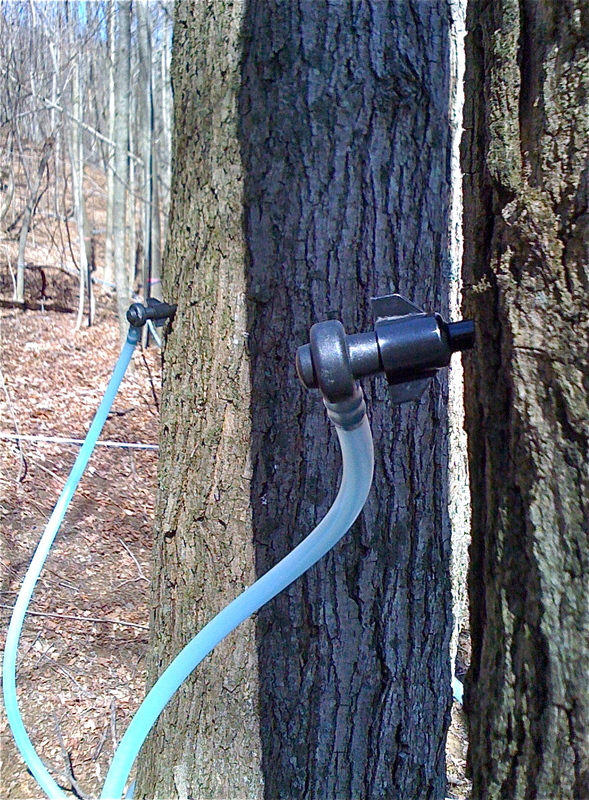 Neat maple syrup fact: when Brandon and Kyle started making syrup as a hobby when they were younger, it took them about 60 gallons of maple sap to make just 1 gallon of maple syrup?! If you visit Saturdays this season at Slow Food Pittsburgh’s market in the Strip, you’ll have the pleasure of meeting Brandon, and can try a sample of Pennsylvania maple syrup yourself (and perhaps even snag a pancake)! Rumor has it that there may be maple syrup cotton candy being spun at the market this year as well. We sampled it at their camp- it is something you do not want to miss! In other local food news, the annual Farm to Table Conference is at the convention center downtown this Friday and Saturday (March 23rd/24th). I have gone in years past, and it is an excellent experience. Informative lectures on topics such as the safety of drinking water in our area, food policy, healthy eating, and the remarkable produce and products from our region. There are cooking demonstrations for adults, and events for kids as well! Local producers and organizations have exposition tables throughout most of the day, which allows a great chance to speak with those involved with various aspects of local food. For an extra fee, you can attend a local food tasting on Friday night. For more information, go to Farm to Table’s website at http://farmtotablepa.com/. Farm to Table has graciously given me a pair of conference tickets to give away to a reader. The giveaway will be open until Wednesday at 11:59pm, and the winner will be notified via e-mail and on this site on Thursday by 8AM. No worries, your e-mail address will not be posted! To enter, post a comment on this site naming your favorite local food or business, or tweet it on Twitter @cookingscraps. Winner will be chosen at random. Hope to see you at the conference! I was at that event! How did we not meet?!? So close! I meant to blog about it, but alas, after all that maple forest observing, I somehow didn’t find the time to edit my way through my photos. It has taken me 5 months to respond to this, apologies! I’ve been off adventuring and out of my kitchen. At the next event, I’ll be more open about meeting other bloggers- I tend to get a bit socially awkward at large events! Ha! No problem. I think we actually sort of met at Assemble? I was going to bring it up, but you had to leave early. Or maybe I’m mixing up worlds. I knew you looked familiar! It makes so much sense now. Can’t remember where we first met, but glad that we did! Next time we’ll have to combine our love of food! My mother is a big fan of Piper’s, but one of my favorite local Pittsburgh treats is having lunch at what we lovingly refer to as “the garage door restaurant,” the little place behind Enrico’s in the Strip. Having a Rosa sandwich (vegetarian) at one of the little tables along the sidewalk, with just a peek of all of the passers-by, shaded from the bright sun is my idea of a great Pittsburgh day! That sounds like a terrific idea to me as well! That’s another place I’ve always wanted to try. Now that I’m back in the ‘burgh I’ll have to add it to my list. I really enjoy visiting Piper’s Pub on the South Side of the city. They have loads of vegetarian and vegan options as well as the best Scotch eggs in town. They are a great group of people serving great food, beer, and whiskey. Thanks, Colleen! I’m loving these great vegetarian/vegan recommendations. I thought I knew where to find good veggie grub in Pittsburgh, but now I need to add Piper’s and Burgatory to my list! I love maple syrup! I have family in Vermont, and it really doesn’t get any better than getting local cider, maple syrup, ice cream, chocolate, beer…wow! But Pittsburgh has a lot of that, too!! I love going to the restaurant Local in southside that offers a lot of products from various farms. You can never go wrong with a restaurant that buys from local venders! I walked by Local the other night, and it looked so nice with all the windows open. Glad to hear the food is good, too! Great blog! Maple syrup is one of my favorites. I really love Burgatory (they make great “homemade” veggie burgers) and pretty much any local restaurant in the Strip. Pamela’s is probably my favorite! Thanks! I’m always on the search for a good house-made veggie burger, I’ll have to try Burgatory soon!